This jewelry made with alloy metal, every crystals is full inlay. The craft is very exquisite. 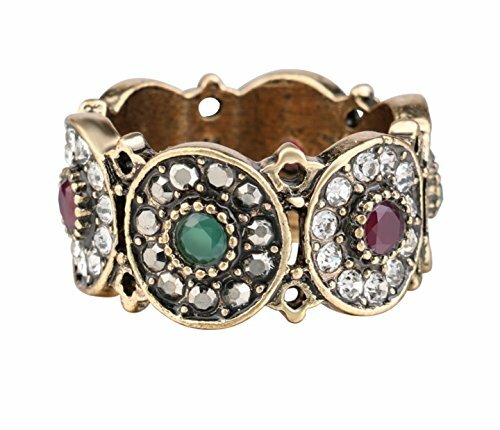 Unique design, women love vintage style Jewelry. It's suitable for global women and Girls, which will make you noble and extraordinary. Put it in your home as an artwork is also a good choice. - Quality problem: We will check every piece of jewelry before shipping, however some may get damage during transit. If you find any quality problem after received, please contact us in 7 days. We will resend a new one for you or unconditionally refund. - Different from the picture: If this product is different from as in the picture after you received, please contact us in 7 days. We will resend a new one for you or unconditionally refund. THE PERFECT GIFT Presented in a stunning suede pouch this is the ultimate jewelry for women, Christmas Gift, Gifts for mom, Birthday gifts for her, Bridesmaids gifts, or simply "Just Because", ensuring a smile on your loved one's face. If you have any questions about this product by Urban Lipi, contact us by completing and submitting the form below. If you are looking for a specif part number, please include it with your message.